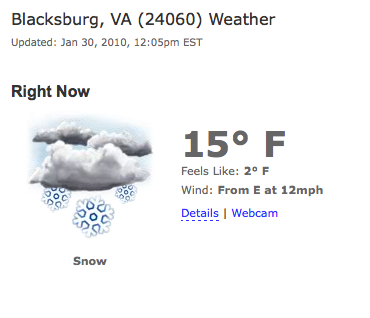 Blacksburg, VA sits at 2,080' according to Wikipedia and is perfectly situated for winter storms and incliment weather. Last weekend while I was home I picked up a pair of Pro Yakrax, the higher of the two models offered by Yaktrax, a company based out of Seattle, WA who promises "Confidence on Packed Snow and Ice." The Pro model are described as "for more active winter enthusiasts" compared to their lower-end Walker model. Follow them on Yatrax Twitter! I figured that since I bought them it wouldn't snow for the rest of the season and I would never have a chance to try them out with my likely move to Florida this summer. I'm glad I was wrong though because early week rumors of snow were running rampant and I was hopeful I'd have an opprotunity to try them out. 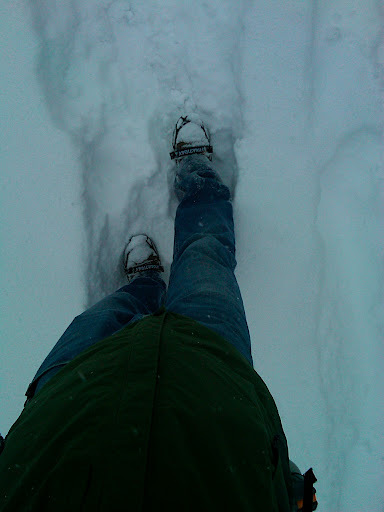 10-14" inches is perfectly adequate to try out my new Yaktrax and once the snow began falling it was only a matter of time. After grabbing an excellent brunch at Gillies it was time to head off to the shop for an afternoon of work. I decided I'd take a few photos of this exciting moment and document it. 3. Identify which end of the Yaktrax says Toes, that part goes on the front of your shoes / boots. 5. 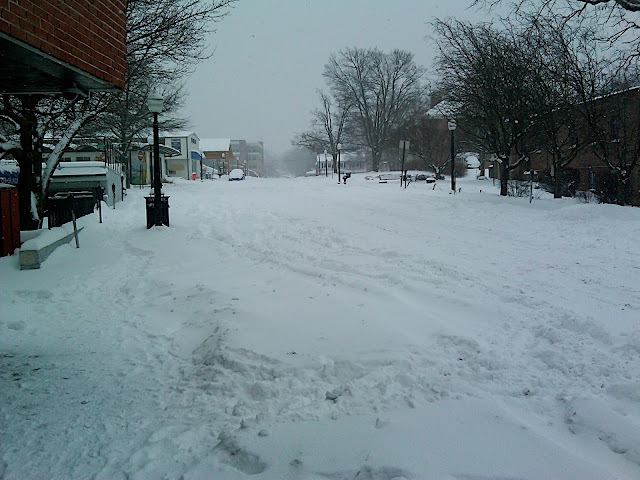 Go out in the snow and play without worry! More to come on them as I use them more / run in them! 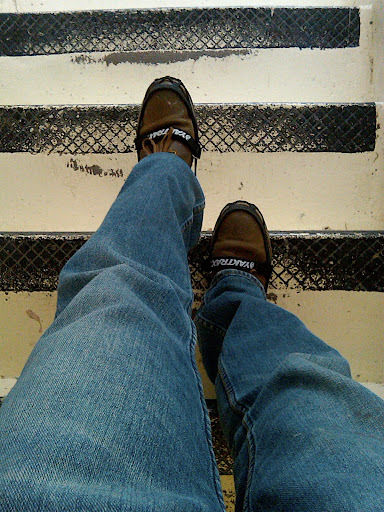 Posted by Unknown at 10:32 AM , Links to this post , 0 comments I'm reading from MyDailyGround: How to use Yaktrax! Tweet this! Posted by Unknown at 5:50 PM , Links to this post , 2 comments I'm reading from MyDailyGround: Registered for my first Tri! Tweet this! This past weekend while I was home I began investigating a new point and shoot camera that would endure the abuse subjected to it by an athlete. 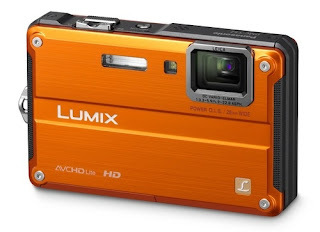 For what seems to be an increasing market with more and more "large" electronics/camera manufactures joining in, today there was an exciting announcement from Panasonic about the Lumix DMC-TS2, an update to their initial rugged camera, the Lumix TS. The camera features 14.1 MP, HD video, and 6x optical zoom as well as meeting my standards for waterproof (10 meters), shockproof (2m), and freeze proof (14 F). Gizmodo Article about the new camera and the official press release from Panasonic here. Posted by Unknown at 10:40 PM , Links to this post , 0 comments I'm reading from MyDailyGround: News on the P&S Search Tweet this! Today was my first day of Yoga at In Balance Yoga Studio. I had been debating on whether or not to enroll in the class because of the price but was encouraged by several of my coworkers that since I was working and it was something I wanted to try, I should do it. I purchased my 10 sessions at a wallet breaking $100 (10/ session is the student discount) and scheduled my first class using the online scheduler. An alternative to the yoga studio I chose was Rec. Sports through Virginia Tech ($15 for the mind body package) for unlimited yoga for the semester, but wanted a personal experience with more one-on-one instruction. My initial outlook was that it would be a great way to start my day, motivate me to get up early, and if I gain flexibility and strength while flushing toxins from my body why not? I seem to be accumulating a good bit of athletic / sports equipment because while yoga is fairly simple you have to purchase a mat ($9 at Walmart) and it seems like every "activity" has its accessories. Gentle Flow Yoga - A gentle vinyasa class focusing on breath and alignment. This is a great class for beginners. I was correct on my assumption that the studio would be more personal and a better instructor-student ratio which today was 1:3, possibly in part to being at 7AM on a Monday, but hey... I like to make the most of my day. The class was enjoyable and certainly not easy and slow enough in pace that I learned some of the moves and positions, as well as the combination that are common. After that it was work from 9-2, a little studying and lunch and then off to the cycling team meeting, followed by an information session about a beginner Triathlon training program. Give it a Tri is an 8 week entry level training course designed to help individuals complete a sprint triathlon on March 27th, The Smithfield Sprint! The program has 4 weekly training meeting including 2 swimming nights (Wednesday and Friday evenings) and 1 running and cycling session each week, as well as a meeting about Triathlons including information on transitions, nutrition, and other important info. for newbies! The Smithfield Sprint consists of a 300m swim, 10 mile bike, and 5k run. I don't believe that I'll have any problem completing it and the best part is that it's on our off week for VT Cycling so I will not miss a race! All I can say is that I'm stoked! Posted by Unknown at 8:17 PM , Links to this post , 0 comments I'm reading from MyDailyGround: Yoga and Give it a Tri! Tweet this! The last time I purchased a point and shoot camera George W. was in the first year of his first term, I was a freshman in high school, Circuit City was still open, and 5 megapixels... while not top of the line was a big deal. My Sony Cyber-shot DSC-P10 lasted for almost 8 years before it bit the dust. The Sony lasted me through high school, most of college, a trip cross-country on a bicycle, and 2 weeks at Philmont Scout Ranch in Cimarron, NM. The time at Philmont included some of the most abusive days of its life until this past summer when it was was subjected to surviving 70 days in a plastic bag in the back pocket of my cycling jersey. It survived rain, sweat, dirt and grime and only started to fail me the last few weeks of the trip when it would work sporadically. Fast forward 6 months. I find myself slightly more motivated to purchase a point and shoot after lugging around my SLR everywhere and I find myself overwhelmed with the options on new p&s. Instead of comparing price tags and megapixel made a list of desirable attributes to help narrow the selection. 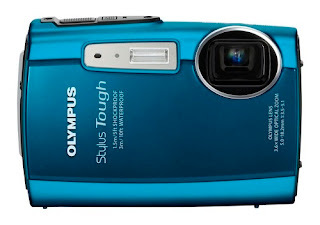 Since the primary function of this camera will be outdoor use, I want the camera to be rugged. Now what defines rugged you ask? Well shockproof, cold proof, waterproof and basically able to take anything I throw at it for the next 8 years or longer. More importantly is the extent to which the above listed qualities are applicable. A camera that's waterproof to 10 feet is cool but what if I decide I want to learn to scuba dive and need something more, say 30 feet? (I understand light and depth of water varies depth of color) Of course weight, size, and battery life are important but I really want a camera that can shoot HD video as well. In come the contenders, now it would be much more exciting it were gladiator days and the cameras were like the cell phone in Transformers and fought to the death, but I guess I'll simply have to do it the old fashioned way and compare pros and cons. I'm surprised at the lack of participation from major manufacturer in the "rugged" camera category. 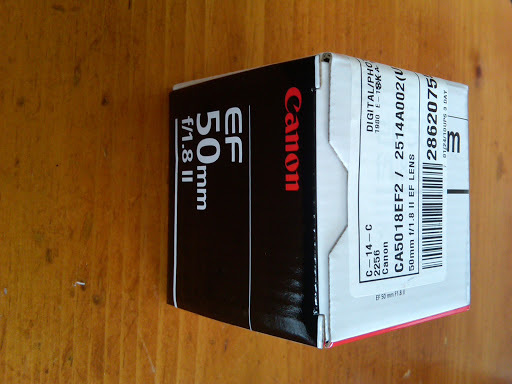 Canon has only one option which fails to meet my rugged demands and looks as if it is intended for children. The bubble lens makes the camera large and odd in pocket. Sony doesn't even have a camera that falls into this category unless you consider there recently leaked DSC-TX5. Photos were leaked earlier this month and quickly pulled but not before most tech sites grabbed the photos. It'll be interesting to hear the specs on the camera once the details are officially released. 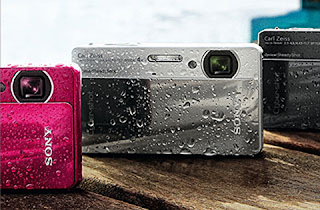 Also competing in the rugged category are Pentax and Olympus with their Option W and Stylus Tough series respectfully. The Pentax W80 which seems to have replaced the W60 which DCRainmaker Ray uses, has lots of bad reviews concerning the graininess of the photos but closely matches my requirements in my price range. The Stylus Tough series are pretty cool and I had an opportunity to play with both the 6000 and 8000 today at Best Buy, but don't shoot HD video that the newly released 3000 does. Olympus says this is the first of several Tough cameras to be released this year which makes me want to hold out for the release of the 8000 with HD video. My problem with all of these cameras is the decrease in quality of everyday photos (particularly indoors) for added function. I have some time before I intend to make my purchase so I'll keep researching and reading as much as I can and hope that I find something that meets my demands. Posted by Unknown at 11:06 AM , Links to this post , 0 comments I'm reading from MyDailyGround: The Search for a new Point and Shoot! Tweet this! I have to be at work in 24 minutes so this is going to be a quick post. 1. Classes started today - My schedule is cake, it involves class from 9:30AM-10:45AM Tuesday and Thursdays. Yup, that's it! ....okay I almost forgot I have 3 online classes, one of which I finished early, well all but the listening part of the final at least. 2. I've decided I want to start doing yoga. I have tried it in the past but never really stuck with it so I'm committing to it this semester. I found a really sweet studio called In Balance Yoga, and while it's expensive, I think it's important to take care of your body and feel that it's a much better use of my money then say booze at the bars. Why In Balance Yoga and not a gym or through campus. Well for several reasons including a small studio where the experience is personal. I feel more comfortable about what I'm learning if it's not student run. It's also HOT yoga which is something new and exciting to try and I'll have more to say after I've started. 3. My mom informed me that the Garmin Rebate for my 310XT came in today. I could just take the money responsibly and put it in the bank account but as I mentioned earlier I think it's important to take care of your body. So I'm more seriously considering the Tanita BC-1000, more on that later. I now have 16 minutes to get to work, yikes! Posted by Unknown at 11:36 AM , Links to this post , 0 comments I'm reading from MyDailyGround: A few Quick things! Tweet this! It took close to 20 hours but it's finished, well almost. This weekend I spent a couple hours Friday evening, ALL day Saturday, and several more hours Sunday evening completing my online Music Appreciation course. The class is self paced, which allows student to complete the 54 quizzes as they please, as long as they're submitted before midnight May 5th, 2010. I decided to get it out of the way and committed the weekend to enlightening myself in the arts, including the classic, romantic, and impressionistic eras. The 54 quizzes were comprised of 14 reading for which I read over 400 pages of an online book to complete, as well as 40 listening exercises. All that's left is the final which is 20% of the total grade and split half listening and half based off the reading quizzes, which I should be able to complete as soon as my professor makes it available for me. After all of the reading I feel that I do have a decent understanding of the development of music and how music influenced society and where we are today. Do I care? Not really, but it fills a needed core area and put me 9 credits away from graduating. Not exciting, but that's what I did this weekend! Posted by Unknown at 9:42 PM , Links to this post , 0 comments I'm reading from MyDailyGround: 1 down, 3 to go Tweet this! Today marked the last Friday before classes start (next Tuesday) and therefore my last free Friday. The commotion out on the street tells me the students are back (sigh), I really enjoy Blacksburg when its quiet and tame. The big giveaway that students were back and classes were about to start is in the photo below. Three beer trucks parked outside of my apartment today loading up for the big parties the weekend before classes start. 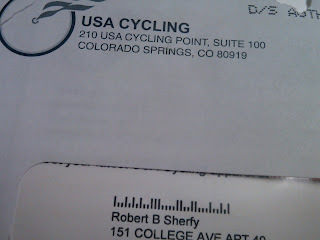 I also received some mail yesterday that was pretty exciting. 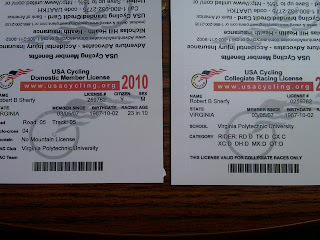 Both my collegiate and category 5 licenses arrived motivating me to get ready for the upcoming season, which starts in less than a month, yikes! which includes racing almost every weekend throughout the semester, Sweet! Posted by Unknown at 9:32 PM , Links to this post , 1 comments I'm reading from MyDailyGround: TGIF Tweet this! Tonight I purchased MyDailyGround.com for the very fair price of $10 for an entire year or $0.83 a month. Now don't you loyal fans worry (Jeff, Steve, and Mom; pretty bad I can count them on one hand, and Michelle doesn't count because she's obligated to whether she likes it or not) you'll be redirected if you bookmarked the old page. Posted by Unknown at 9:46 PM , Links to this post , 0 comments I'm reading from MyDailyGround: MyDailyGround.com Tweet this! 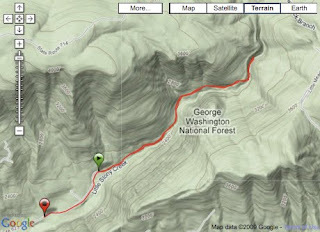 see Brett and Michelle, trail running in less than 20 degrees; also see fool. After hearing rumors Monday evening that the Cascade Falls just West of Blacksburg were frozen, Michelle and I decided to brave the cold and hike up them Tuesday morning. We left Blacksburg a few minutes before seven and made the short drive down 460 arriving around 7:20. It was 19 degrees and felt much colder with the wind chill but Michelle and I finally worked up the courage to get out of the warm car and begin our hike. The majority of the two mile trip to the falls is uphill and after moving for a few minutes we warmed up enough to feel most of our extremities. I decide to bring the DSLR to try to capture some cool photos of the falls. This was the first and quite possibly the last time I take this camera with me on an outing, simply because of the size and weight which has led to a new point and shoot camera search (more on that later). The first mile or so went fairly smoothly not moving too particularly fast but holding a respectable pace when I almost ate it face first on a 3 inch thick slab of ice. We arrived at a point where the entire trail was frozen across for what seemed to be about 100' up the trail. After some very slow and careful maneuvering we managed to get past the hazardous ice slide (which made for quite a fun time on the way down) and decided it was best to take the rest of the hike slowly. In the photo you can see the crazy ice patch that we would later slide down and Michelle's very happy to take it easy the rest of the way expression. My favorite photo of the morning and not because of the lighting or the quality, but because of the caption that goes with it. This was one of Michelle's less happy moments of the run and I was threatened with "If you take a picture right now, I'm going to hurt you!" Just over an hour we reached the top and could see the falls were frozen as we rounded the corner. We spent about 15 minutes up there where it was definitely much cooler and quickly headed back towards the warm car. 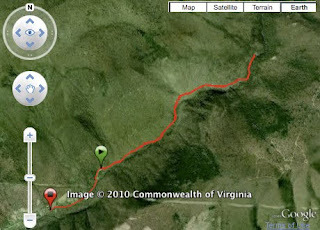 Garmin 310XT data for the hike using the terrain mode on Garmin Connect...if only they had an export photo or JPEG option. Garmin has also been pushing the new Google Earth plug-in for Garmin Connect but so far I've been kinda disappointed with the results. So the patch of ice that gave us trouble on the way up was way more fun on the way down when we decided to turn turn it into a big slide! And finally when we returned to the car, yup only 24 degrees! 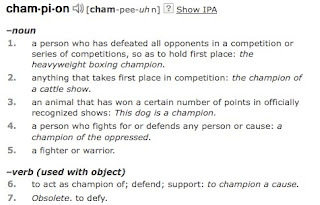 Posted by Unknown at 3:20 PM , Links to this post , 0 comments I'm reading from MyDailyGround: Champion - [cham-pee-uhn] - noun Tweet this! I wasn't home for 24 hours before I had left again for Blacksburg. Since Michelle got off the train with me in Alexandria my drive was slightly longer than usual, with a trip down 95 and all the way across 64, dropping Michelle off on the way and finally down 81. On my way Michelle and I stopped by a Starbucks where they had a Sirena espresso machine on the shelf. The Sirena machine is a semi-automatic 15 bar machine that retails for $400. The machine was on sale $170 off for $230, an offer too good to resist. I let them know that I wanted to purchase the machine and they informed me they were sold out and they only had the floor model which was not for sale. After some negotiating I convinced them to sell me the machine but they didn't have a box or the power cord, so they offered me 15% off to compensate. When I went to pay the machine rang up at $200 with 15% off making the machine $177. 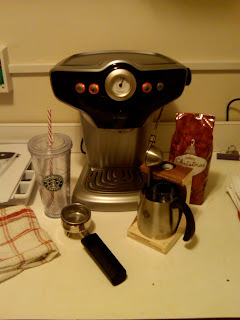 Even better was that I had nearly $80 in Starbucks giftcards from everyone for Christmas so all in all I paid $97 for a $400 espresso machine, Awesome! I also had to pick up a steaming mug and thermometer, but it's been a ton of fun making drinks and has been something I've wanted for a very long time. 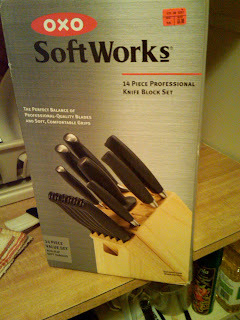 Speaking of good deals, I picked up a sweet knife set that was on clearance at Target which are much meeded. 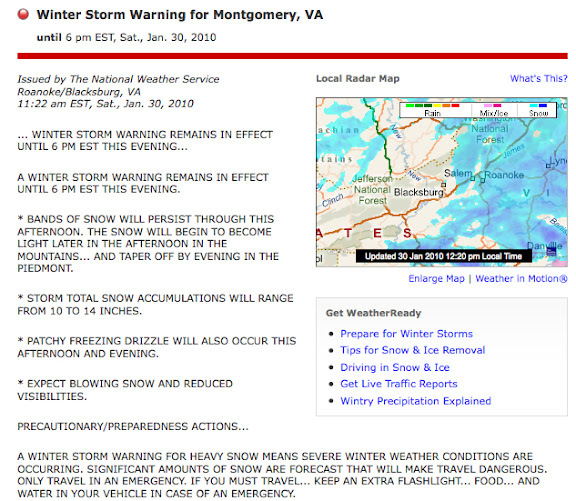 Posted by Unknown at 8:51 AM , Links to this post , 0 comments I'm reading from MyDailyGround: Back to Blacksburg! Tweet this! As with all good things our trip had come to an end and it was time to hop on the train back home. Before heading to the train station the four of us grabbed breakfast at a diner around the corner where I had some awesome Egg's Benedict. Afterwards we hauled all of our stuff to Penn Station and patiently awaited our train. My experience with the train system is bitter sweet. I like the convenience of not having to worry about driving or the added stress that comes along with it, especially in the city, and the no nonsense of checking bags and waiting for luggage. However on both domestic train rides there have been delays and downtime that I did not experience with the European train system. That being said, the ride home went fairly smooth other than the door to the end of the car not shutting and making the first hour of the ride quite chilly. Michelle and I managed to snag a four-seater that we had to ourselves almost the entire ride. We arrived in DC around 5:10 about 10 miles from our stop which was scheduled for 5:15. Amtrak changes engines in DC switching from diesel to electric which on the way there took about 20 minutes. On our return home the car in front of us had to be replaced to a problem with the brakes and we waited nearly an hour and a half, for what was supposed to be a "15-30 problem." Had we known that it was going to take so long we could have hopped on the metro and been home much sooner, but it was an experience, bitter sweet. It was a great trip and I hope to return to the big city before too long, maybe next time it'll be warm enough to ride some while I'm there! 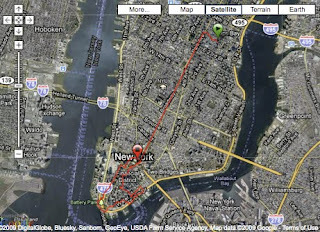 Posted by Unknown at 2:11 PM , Links to this post , 0 comments I'm reading from MyDailyGround: Day 5 - Trip to NY - Return Home Tweet this! Our last full day in NY was New Years Day and made the most of it by staying away from Times Sq. crowds and instead headed Downtown. We hopped on the 6 Downtown and got off at city hall where the Mayor was being inaugurated. The inauguration made navigating the few blocks around city hall difficult because of street closings and barricades with security check points. This building was pretty amazing really, it appeared as if the metal scaffolding was holding up the wall up, which it actually very well may have been. After navigating through an overwhelming amount of police officers we made our way to Ground Zero which was chilling. I took only one photo, an empty skyline. After Ground Zero we headed to Battery Park which had a great view of the Statue of Liberty and is where you take a ferry across to Ellis Island. Battery Park was in the News this fall when a high ranking government employee approved an Air Force One low-flying photo opportunity with the Statue of Liberty in the background without notifying the city of NY. We kept walking along the water back towards the Brooklyn Bridge and stopped by the Pier where they had an awesome sail ship / flag ship. We headed towards Wall St. and as all of us were getting hungry for lunch we decided it was the perfect opportunity to get my NY street vendor hot dog, which took me all of 10 seconds to eat. Spotted this crazy yellow building near Wall St.
One of the only pieces of art I found DT near Wall St. It made for a cool photo opportunity with Michelle. Wall St. wasn't much other than another Tiffany's and another barricaded building with some big white pillars, can you tell I was unimpressed? The rest of the afternoon was spent relaxing and another trip to Times Sq. which was total fail since the Old Fashioned Soda shop was closed. 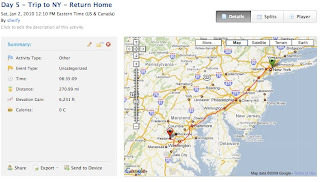 The days Garmin 310XT tracking. The long straight line are the beginning and end of the metro when the watch regained satellite tracking. Posted by Unknown at 1:19 PM , Links to this post , 0 comments I'm reading from MyDailyGround: Day 4 - Trip to NY - New Years Day! Tweet this!